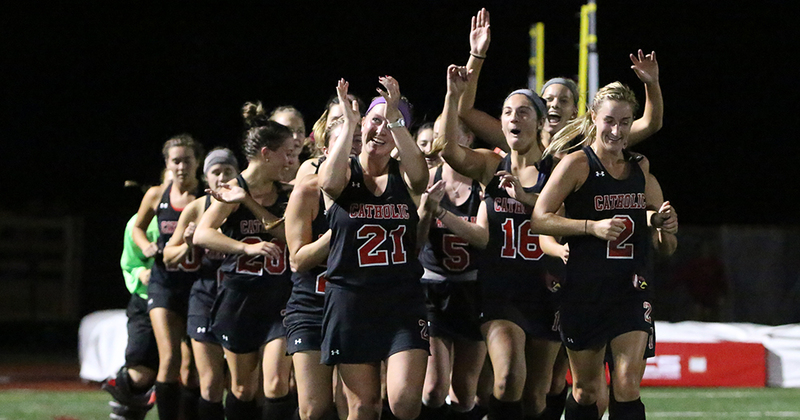 This past week the nationally-ranked Catholic University of America field hockey team earned its eighth-straight win, beating Ursinus 6-2. Sophomore Alexa Guittari started the game off by scoring the first goal for #11 Catholic, and she would later score another goal in the first half. By the start of the second half, senior Kerri Shallow scored her third goal of the season, bringing Catholic’s lead to 3-1. The field hockey team was just warming up, though. Senior Rachel Baca, junior Molly Crowley, and junior Lane Adams all scored goals off of penalty corners. Senior Marisa Martinelli assisted on all three of the goals scored. Senior midfielder Rachel Baca was asked how she felt after the win over Ursinus. “It was a challenging game, even a little spooky at times, but we managed to pull out a great win,” Baca said. Catholic started off the season ranked 18th on the National Field Hockey Coaches Association Coaches Poll. Since then, they have moved up in the rankings, while defeating teams ranked higher than them. Once Catholic defeated Elizabethtown 4-2, its rank jumped up six spots to number 12. The most impactful game of the season was against, at the time, #7 Salisbury, and Catholic came out on top 3-2. This jumped the team’s rank up one spot to become number 11 on the poll. Catholic is currently 12-2 overall and placed second in Landmark Conference with a perfect 5-0 record. Senior captain Kelly Cousoulis has also had a great season so far. The National Field Hockey Coaches Association has selected Cousoulis to play in the 2017 Division III Senior Game in November at Bellarmine University in Kentucky. She is one of the 60 participants selected. Cousoulis received Synapse All-American and Landmark Defensive Player of the Year honors last season. This past week, she has received Defensive Athlete of the Week, which is a title she is familiar with. Cousoulis has started every game and played almost every second of action this season. Even against #7 Salisbury, Cousoulis performed with three defensive saves and one assisted goal. When asked how she felt to be selected to play in the 2017 Division III Senior game, Cousoulis responded humbly. This weekend Catholic is away at Drew, who is in 8th place in the Landmark Conference standings. Catholic will be playing against the top team in the Landmark conference, Scranton during Homecoming Weekend which will be an important match-up as the conference playoffs loom on the horizon. That game, which is also the team’s senior night, is set for October 28th at 5:30 PM at Cardinal Stadium.